Buy All 10 and Save! 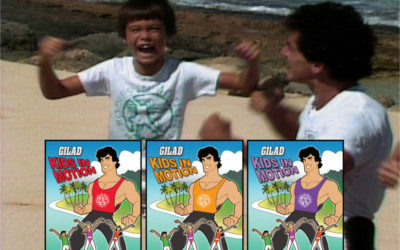 Join Gilad on the most beautiful beaches in Hawaii. 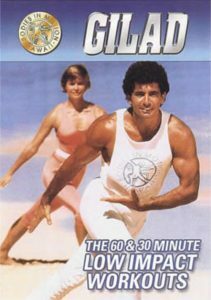 These DVDs are filmed on the most famous and beautiful beaches in Hawaii. Thes are our fans favorites. They are all commercial free. 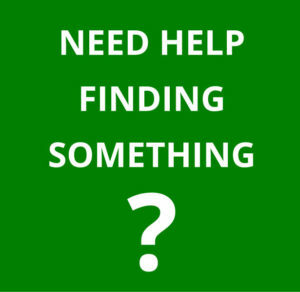 For a detailed description of each DVD please scroll down. These workouts are also available for downloads and streaming. 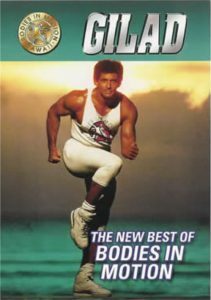 Fat Burning Routine This DVD combines high-energy fat-burning routines with muscle conditioning. The program is designed to help you burn calories and tone your muscles quickly. This workout will give you results fast. The program is taped in Jerusalem with the historic Old City as a backdrop. An exotic live band combining eastern and western style music is guaranteed to get your “Bodies in Motion”! Builds Cardiovascular Endurance and Burns Fat This creative routine builds cardiovascular endurance and burns excess fat at a fast rate. A nice variety of moves without complex choreography will keep your body in motion. The BONUS abdominal section will help firm and reshape your stomach area as well. 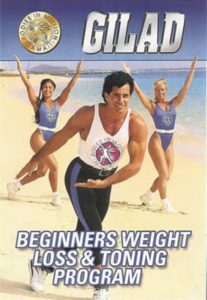 Set on Waikiki Beach with Diamond Head in the background, this workout is recommended for the intermediate to advanced participant. Burn of those excess pounds and tone those ‘soft spots’ One of our all-time favorites, this workout is guaranteed to burn off excess pounds and tone all those “soft spots”! The program is taped at 12 different beaches on four of our islands. You will love the variety and, even more, you will love the results! Waste away your waist! If your stomach needs trimming, this is the workout for you! 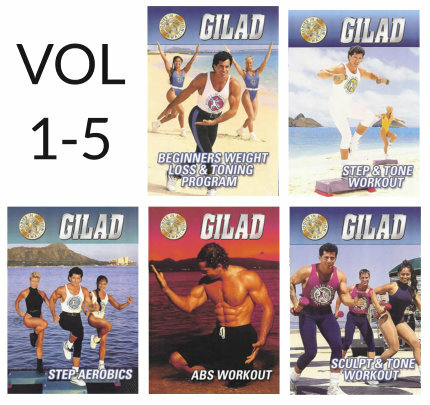 Gilad has developed a unique program that works for both men and women and is balanced to work all the muscles around your waist and midsection to help you get that lean waistline. Two low impact fat burning and toning workouts Each workout will give you a fat-burning, cardiovascular workout with minimal impact on your joints. Both workouts include conditioning segments for the abs, hips, thighs and arms.The 30 min workout is geared for the beginning level and will prepare you for the 60 min workout which is for the more advanced. 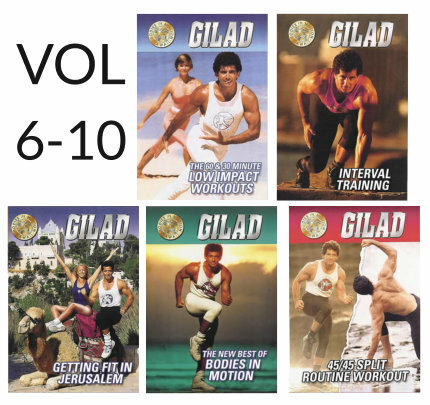 Interval and circuit training In this DVD Gilad combined his experience as a decathlon athlete and fitness officer in the military to produce a workout that combines calisthenics in a new and energetic fashion. Using the principle of interval and circuit training, this workout is ideal for men and women. Geared for maximum results in minimum time. 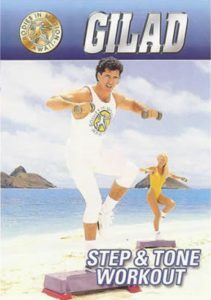 Step and Tone In this workout Gilad uses a step and light hand-weights to combine fat burning and toning in one workout! The moves are easy to follow so you’ll enjoy results right from the very first workout. 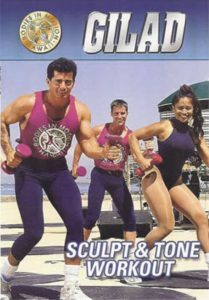 Gilad and his team will keep you motivated as you step and tone into shape! A total muscle-conditioning workout. Strengthen and define your entire body with this total muscle-conditioning workout. This program will help increase your lean muscle-to-fat ratio, making you look and feel your best! Light hand-weights 1-5 lbs. are used throughout the workout. The moves are simple and easy to follow and you’re sure to get results everyone will notice!